What's the best credit card to use on a business trip? If you're jetting off to Tokyo, Paris, or Sao Paulo every few weeks, the answer will likely be different than if you're driving to different client sites every day. CNNMoney asked experts at two credit-card comparison websites -- Jill Gonzalez, an analyst with CardHub and Sean McQuay, credit card analyst with NerdWallet -- to share their top credit card picks for 8 kinds of business travelers, from road warriors to small business owners to international jetsetters. For a business person who flies, drives, dines -- basically does a little bit of everything -- Gonzalez recommends the BarclayCard Arrival Plus. 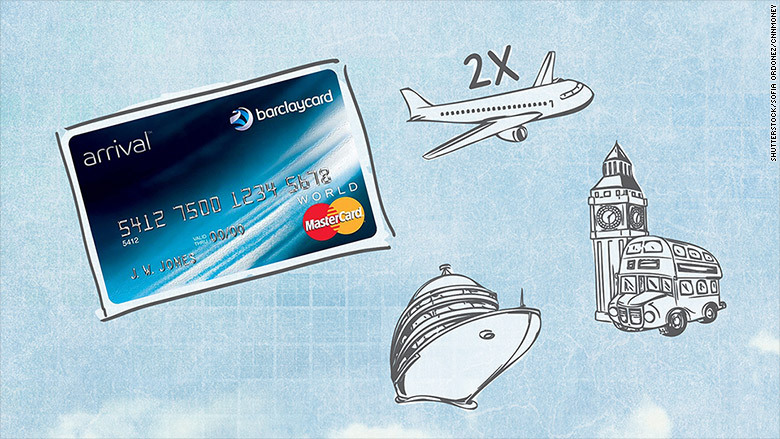 It offers 2x miles on all purchases, while many other cards only double mileage for specific categories. What's more, miles can be applied to more than just flights and hotels -- they can be used for anything from discount travel sites to cruises to taxis. The card is ideal for use abroad, Gonzalez says, since there's no foreign transaction fee. And in general, credit cards offer a much lower exchange rate than banks, credit unions and airports kiosk exchanges, she says. The card is free for the first year. After that, there's an $89 annual fee. While that's higher than some other cards, you can easily make up the difference with extra rewards, says Gonzalez. "Of course, you should avoid fees if you can," she says. "But we always say if the rewards are lucrative, and you're saving money in the long run, go for the card with the fee."